If you think kombucha tea is just another health fad that’s here today and gone tomorrow, think again. More than just the fastest growing product in the beverage market today, it has been recognized as a potent therapeutic and prophylactic drink for thousands of years. In fact, kombucha tea health benefits are documented as early as 220 B.C. It is not only healthy, but sweet and refreshing. Kombucha is a fermented beverage obtained from the symbiotic culture of bacteria and yeast (also called SCOBY or kombucha mushroom). It is usually prepared by inoculating a tea fungal mat grown previously to a freshly prepared tea broth. The most popular substrates are green tea or black tea with white sugar. Once the combination of the kombucha SCOBY and tea is prepared, all you need to do is to wait 5-10 days to yield the popular fermented drink. The word kombucha is derived from the Japanese words “kombu” which means seaweed and “cha”, meaning tea. It is called by many names – red tea fungus, ling zhi, kombucha mushroom tea, and teekwass, among others. Fermented foods and drinks like kombucha tea have been a staple of various cultures around the word for centuries. However, it has only recently become popular in the US. Kombucha tea is believed to have originated in China and distributed in Japan. Since oriental medicine practitioners believed in its medicinal properties, it has spread through Russia, Eastern Europe, other parts of Asia, and eventually, the United States. From being a humble homemade recipe literally passed on from one household to another (as the kombucha SCOBY can be used a couple of times), it has also grown into a commercial functional beverage taking up significant shelf space in stores globally. 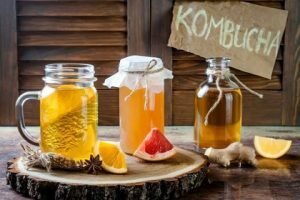 In the recent years, US Food and Drug Administration and Kappa Laboratories from Florida have conducted a microbiological and biochemical test which proves that kombucha tea is safe for human consumption. However, jury is still out on its therapeutic properties. 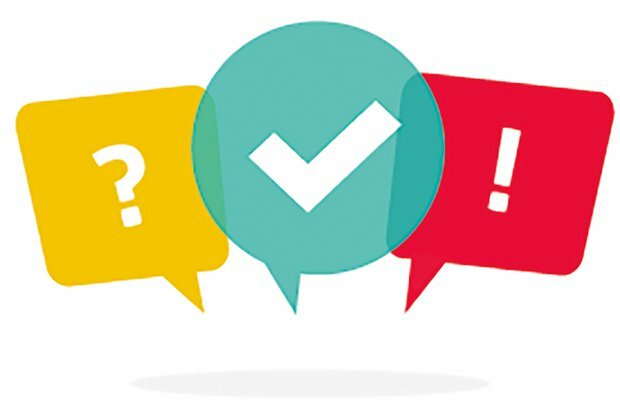 Below, we will find a list of health benefits and their evidences that may help you decide if you want to make kombucha tea a daily habit. If there are superfoods like beets, turmeric, and salmon, then kombucha tea might be worthy of being called a super drink. Numerous studies have scientific evidence that regular intake of kombucha has prophylactic and therapeutic benefits. It is good for the gut, brain, heart, liver, kidney, blood circulation, and lungs. It is even said to have a beautifying effect on our hair, skin, and nails. One study on the efficacy of kombucha tea attributed its health benefits to its four main properties: antioxidation, detoxification, energizing potencies, and improvement of depressed immunity. All these and more make it an attractive functional beverage for those who want to stay healthy and veer away from a wide array of metabolic and infective disorders. Kombucha tea is a powerful antioxidant. Among its therapeutic properties, much is written about the abilities of kombucha tea to scavenge free radicals, reactive oxygen species (ROS) in particular. Kombucha tea contains a lot of tea polyphenols and other compounds that support the body’s normal detoxification process. One of kombucha’s components, GlcUA or glucuronic acid, processes the toxic metabolites and chemicals in the body called xenobiotics, modifying them into compounds that can be excreted easily. Because of this, it is believed that the consumption of kombucha tea helps protect our bodies from the toxicity caused by xenobiotics from environmental pollutants, pharmaceuticals, and other toxins. According to comparative studies, kombucha tea’s antioxidant property is 100 times higher than vitamin C and 25 times higher than vitamin E. It also supports the body’s built-in hepatic glutathione detoxification system. damage. It also boosts natural detoxification by increasing the amount of active glutathione in the liver. Kombucha tea supports gut function and helps in gut healing. It stimulates the contraction of the stomach and intestines. It inhibits the progression of gastric ulcers. Kombucha tea’s healing properties can be attributed to its ability to protect the gastric lining content (mucin), prevention of lipid oxidation in the stomach lining, and ability to reduce gastric acid secretion. Its healing ulcer-healing abilities is so effective that it a 15 mg/kg preparation of kombucha tea is deemed comparable to the effect of a 3mg/kg omeprazole. Kombucha tea helps protect and detoxify the liver. Antioxidants are the liver’s best friend. As the body’s main detoxifier, anything that could take the load off from the liver would greatly help the organ fulfill its functions. According to a number of studies, the regular intake of kombucha tea reduces the levels of bilirubin and liver enzyme markers like ALAT, ASAT, ALP, and MDA that may signify liver problems. Kombucha contains glucoronic acid. This contributes to liver detoxification by helping the liver enzyme called glucuronyl transferase change bilirubin into a form that can be better expelled from the body through the bile. As discussed in a previous point, glucoronic acid also helps the body get rid of xenobiotics from pollutants, pharmaceuticals, hormones, and many more. This happens during the phase II liver detoxification process. The tea also improves the regeneration rate of liver necrotic tissues to its normal condition. This is good news to those who are recovering from liver diseases. Through this mechanism, the liver itself is also detoxified. Lastly, since kombucha has the ability to reduce triglycerides and excessive uptake of fatty acids, it helps protect the liver from steatosis and non-alcoholic fatty liver disease (NAFLD). Kombucha tea helps regulate sugar levels. As early as 1929, kombucha’s anti-diabetic properties have already been identified and recognized. In animal experiments, kombucha administration has been shown to reduce blood sugar levels, demonstrating consistent hypoglycemic effects. During the kombucha SCOBY and tea fermentation process, the concentration of phenolics in the concoction increases, making it strong and abundant enough to inhibit pancreatic a-amylase in the small intestine that impacts blood glucose levels. Pancreatic a-amylase plays a crucial role in breaking down starch into glucose that enters the bloodstream. Aside from lowering blood sugar levels, kombucha protected the liver-kidney functions of diabetic rats. All these properties make it a potential supplement for diabetes treatment and prevention. A 2014 research published in the Journal of Medicinal Food states that kombucha tea efficiently acts in health preservation and recovery. Its antioxidant properties are crucial in modulating the immune system. Since free radicals contribute significantly to inflammatory reactions, it is considered one of the main reasons for a number of chronic and degenerative diseases. The vitamin C and B vitamins present in kombucha also provide additional protection against cell damage, development of inflammatory diseases, and depression of immunity. Kombucha tea is not just refreshing and tasty, it is also an effective energy drink! Some avid kombucha drinkers even swear by its instantaneous energy-boosting abilities. And it’s probably not just a feeling. Kombucha’s energizing ability may be explained by its effect on blood circulation and hemoglobin levels. Iron from the tea substrates and gluconic acid increases blood and oxygen supply to body tissues and stimulates energy synthesis. Organic acids and vitamin C in kombucha, on the other hand, enhances iron absorption and increases vitality. B vitamins also promote energy regeneration via the activation of lipid and protein metabolism. When you are energetic and disease-free, of course you will have a clearer mind and better mood. But kombucha tea doesn’t just make you feel good. There is science behind its effect on brain function. If you have been reading our blogs and newsletters, you have probably come across the idea of brain-gut connection. The gastrointestinal system and the brain are connected by the vagus nerve. So the state of our microbiota plays a significant role in brain function, moods, and stress response. Gut bacteria or probiotics that produce mental health benefits are called psychobiotics. Fermented foods and beverages like kombucha tea and the likes are rich in such bacteria. Aside from the presence of psychobiotics, the polyphenols from the tea substrate used in making kombucha tea also contribute to antioxidation which in turn helps alleviate brain fog, anxiety, and depression. The antimicrobial activity of kombucha mushroom tea was tested against a number of disease-causing microorganisms like Staphylococcus aureus, Shigella sonnei, Escherichia coli, Aeromonas hydrophila, Yersinia enterolitica, Pseudomonas aeruginosa, Enterobacter cloacae, Staphylococcus epidermis, Campylobacter jejuni, Salmonella enteritidis, Salmonella typhimurium, Bacillus cereus, Helicobacter pylori, and Listeria monocytogenes. All those pathogenic organisms were found to be sensitive to kombucha. It is believed to be mainly due to the presence of acetic acid and large proteins in the beverage. Kombucha tea has anti-cancer properties. Kombucha may help with weight loss. A lot of people turn to kombucha to lose weight. This is because there is evidence about its ability to improve and speed up metabolism. Due to improved digestion, nutrient absorption, and regulated blood sugar levels, kombucha helps suppress appetite. These conditions also favor fat burning instead of storage and accumulation. Apart from boosting digestion and metabolism, kombucha helps those who want to reach and maintain their ideal weight by reducing number of fatty droplets, inhibiting the accumulation of triglycerides, and lowering cholesterol levels in liver cells. Kombucha tea is a culture of bacteria mostly from the genera Acetobacter and Gluconobacter, and different yeasts. There a lot of other organic acids found in the tea like glucuronic, citric, L‐lactic, malic, tartaric, malonic, oxalic, succinic, pyruvic, and usnic. After fermentation, a rich cocktail of chemical components other than sugars and tea polyphenols can be found in the tea. Kombucha mushroom tea is also rich in probiotics. The amount of each component is different and subjective depending on the tea substrate, the length of fermentation, and the preparation method. Kombucha is relatively easy to make. If you are a regular drinker, it is best to learn how to make it yourself rather than purchase it from stores. It also tastes better. Boil 4 cups (1 gallon) of purified water. Steep 7-15 minutes and remove tea bags. Add sugar while liquid is hot and stir to dissolve completely. Cool sweetened tea to body temperature or lower. Test on wrist. Poor into a gallon or more ceramic or glass container leaving room for the starter liquid, SCOBY and some breathing space. Cover with cloth cover such as a clean tea towel and secure with a rubber band. Place the container in a dark undisturbed location to brew for 5-10 days. Ideal temperature range is 75-85°F (24-29°C). It brews slower in temperatures below that. 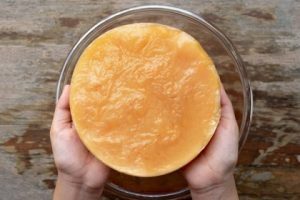 Remove your SCOBY and 1-2 cups of starter liquid for the next batch. Flavor your brew as desired. Repeat the whole process when your supply is low. 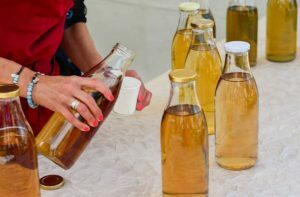 Although kombucha tea has been reported safe for human consumption by the US FDA, caution should be taken as there is a risk of contamination during preparation. Over-fermentation may also be an issue since the acidity of the tea may cause acidosis to some individuals. 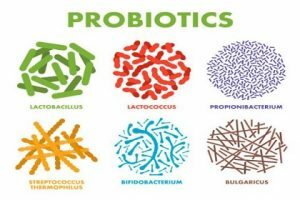 Consumption of 1 to 2 cups per day is enough to maximize the probiotics and other health benefits. Those with pre-existing ailments, pregnant, or nursing should also take caution when drinking kombucha mainly because of the small amounts of alcohol and caffeine content in the tea. When fermenting your own kombucha tea, take note that difference in brewing times may affect alcohol and caffeine levels. Some clinical experiments also prove that some of the antioxidant properties of kombucha are lost when fermented for more than 20 days. Aloulou, A., Hamden, K., Elloumi, D., Ali, M. B., Hargafi, K., Jaouadi, B., … & Ammar, E. (2012). Hypoglycemic and antilipidemic properties of kombucha tea in alloxan-induced diabetic rats. BMC complementary and alternative medicine, 12(1), 63. Banerjee, D., Hassarajani, S. A., Maity, B., Narayan, G., Bandyopadhyay, S. K., & Chattopadhyay, S. (2010). Comparative healing property of kombucha tea and black tea against indomethacin-induced gastric ulceration in mice: possible mechanism of action. Food & function, 1(3), 284-293. Bhattacharya, S., Gachhui, R., & Sil, P. C. (2011). Hepatoprotective properties of kombucha tea against TBHP-induced oxidative stress via suppression of mitochondria dependent apoptosis. Pathophysiology, 18(3), 221-234. Dipti, P., Yogesh, B., Kain, A. K., Pauline, T., Anju, B., Sairam, M., … & Selvamurthy, W. (2003). Lead induced oxidative stress: beneficial effects of Kombucha tea. Biomedical and environmental sciences: BES, 16(3), 276-282. Dufresne, C., & Farnworth, E. (2000). Tea, Kombucha, and health: a review. Food research international, 33(6), 409-421. Hyun, J., Lee, Y., Wang, S., Kim, J., Kim, J., Cha, J., … & Jung, Y. (2016). Kombucha tea prevents obese mice from developing hepatic steatosis and liver damage. Food science and biotechnology, 25(3), 861-866. Marsh, A. J., O’Sullivan, O., Hill, C., Ross, R. P., & Cotter, P. D. (2014). Sequence-based analysis of the bacterial and fungal compositions of multiple kombucha (tea fungus) samples. Food microbiology, 38, 171-178. Sreeramulu, G., Zhu, Y., & Knol, W. (2000). Kombucha fermentation and its antimicrobial activity. Journal of Agricultural and Food Chemistry, 48(6), 2589-2594. Vīna, I., Semjonovs, P., Linde, R., & Deniņa, I. (2014). Current evidence on physiological activity and expected health effects of kombucha fermented beverage. Journal of medicinal food, 17(2), 179-188.